At Davis Dodge, you could find yourself behind the wheel of a Chrysler 200.The 2016 Chrysler 200 surrounds you in luxury, world-class engineering, and stunning performance with Best-in-Class power. You get all this in Canada's most affordable mid-size car. When equipped with the available SafetyTecTM Group, you'll also be driving a 2015 IIHS Top Safety Pick+. Attainable luxury has arrived. Talk with one of our representatives today, and learn why vehicle buyers come from Calgary, Lethbridge and Claresholm for a shopping experience at Davis Dodge. The precise panel fitment and stringent standards of the 2016 Chrysler 200 are the result of a cutting-edge facility built to execute world-class manufacturing methods. All the latest technologies are employed here. You'll find them in the nearly 1,000,000-sq-ft Paint Shop and the advanced quality control centre. When you sit inside the 200, luxury and high quality are immediately evident. The ergonomically designed seats provide outstanding support and comfort. A 12-way power memory driver's seat including 4-way power lumbar adjust and a 6-way power passenger seat are available, along with heat and ventilation options. split-folding rear seats give you excellent cargo versatility. Choose from 2 available sunroofs, including a standard-sized option with power and tilt. For a larger view, a dual-pane sunroof spans most of the ceiling area so that every passenger can experience a sky view. The elegant steering wheel with standard audio and cruise controls creates a high level of sophistication. Two-tone leather and heat are available, along with paddle shifters for a more engaging drive. 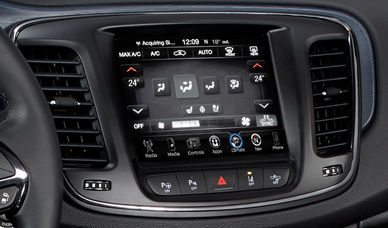 The available dual-zone automatic temperature control allows front and rear passengers to set their comfort levels. It includes a humidity sensor that reduces window condensation and keeps humidity levels low and pleasant. With available finishes like real wood and Bronze Chrome accents, luxury door trim and Sapphire Blue ambient LED lighting, the interior of the 200 surrounds you with world-class refinement. To commemorate such a distinguished milestone, this package is being offered to celebrate 90 years of innovation, value and performance at Chrysler. 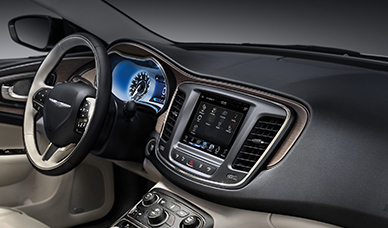 In addition to the standard features of the Limited model, it adds a Uconnect® 8.4 multimedia centre with 8.4-inch touchscreen, heated steering wheel, auto-dimming rearview mirror with microphone, dual-zone automatic temperature control and ParkView® Rear Back-Up Camera9. You'll also find a Chrysler Anniversary logo on the front floor mats and touchscreen, while the overall experience is further enhanced by a power sunroof and remote start system. The sleek and aggressive form of the Chrysler 200 is accented by broad shoulder lines, LED lights and signature horizontal front grille. Function is delivered by its wind tunnel-sculpted aerodynamics, allowing it to slice through the air for a quiet ride and optimized fuel economy. There is a purpose behind every design element on the 2016 Chrysler 200. For example, the upper horizontal grille flows seamlessly over the sharp headlights for a clean and fluid look. Underneath, a large lower grille intake – available in mesh or horizontal blade textures – balances the front end to complete a design that is both aggressive and elegant. All of the 10 exterior colours are applied with the highest standards of quality. It all happens at a groundbreaking paint facility employing world-class manufacturing methods. This ensures the fine attention to detail you expect and deserve. The 2016 Chrysler 200 is available with 8 bold and distinctive wheel designs that make it truly stand out. Configure your 200 above with a choice of 17-, 18- or 19-inch wheels. See clearly with the available High-Intensity Discharge (HID) headlamps. Automatic High-Beam Headlamp Control is also available and seamlessly transitions between high and low beam for efficient nighttime driving. Sharp LED technology illuminates the taillamps and is also available in the fog lamps and daytime running lamps. On the Chrysler 200S and all V6-powered models, you'll enjoy dual exhausts integrated beautifully into the rear bumper. The trapezoidal exhaust tips are mounted into the rear fascia for a smooth finish and hint at the stunning performance beneath. The Chrysler 200 provides impressive fuel economy as efficient as 6.4 L/100 km (44 mpg) highway. A MacPherson strut front suspension and independent multilink rear suspension give you inspired handling and a smooth ride. For drivers who seek out winding roads, the 200S includes a Sport suspension for added performance. Dial in the full performance of the Chrysler 200 with a simple turn of the Rotary E-shift. The optional Sport Mode sharpens throttle response and steering feel, while also pushing shift points into a higher rpm range. This feature also modifies the Electronic Stability Control, available Adaptive Cruise Control with Stop and Go and the available all-wheel-drive system to extract maximum performance. The Segment-First 9-speed automatic transmission is in a class of its own. Where most sedans only offer up to 6 gears, this transmission's versatility allows for more refinement, smoother shifts and stronger acceleration. This also results in better overall fuel economy and performance at all speeds because the ratio steps between gears are much smaller than that of a 5- or 6-speed transmission. This advanced system comes standard on the Limited and 200S and gives you a 5-inch touchscreen, along with an intuitive user interface. Features include hands-free communication with Bluetooth® streaming audio, SiriusXM satellite radio with one-year subscription and more. The available 7-inch customizable in-cluster display is seamlessly integrated into the analog gauge cluster and provides real-time vehicle data at your request. Information like temperature, fuel economy, tire pressures, maintenance, engine performance, direction for the available navigation7 and much more are all displayed front and centre and in full colour. Start the engine from up to 200 feet away. The available Smart Remote Start can also activate the climate controls, available heated/ventilated seats and optional heated steering wheel, all based on the temperature inside and outside the vehicle. 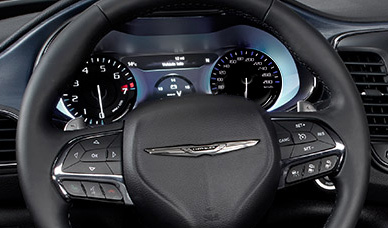 Every 2016 Chrysler 200 comes standard with Keyless Enter 'n GoTM. With the key fob in your pocket, you can unlock the driver's door by simply pulling the handle. You can also unlock the trunk lid with the same convenient approach. With the key fob inside the vehicle, all you have to do is buckle up, press the brake pedal and push a button to start the engine. The days of inserting a key are long gone with this standard feature. Keep both hands safely on the wheel with the available hands-free communication5 with Bluetooth® streaming audio. Make and receive calls, change songs and control the available navigation system7, all with your voice. This available system helps you avoid potentially dangerous situations by alerting you when a vehicle enters your blind-spot area via an audible alert inside the car and a visual icon on the sideview mirror for safer lane changes. This Class-Exclusive feature automatically adjusts your cruising speed based on pre-set speed and vehicle distance settings. In certain circumstances, it can also bring the vehicle to a complete stop without any driver intervention. If you start unintentionally moving out of your lane without using the turn signals, this advanced feature will warn you visually and through a haptic warning – a "shiver" in the steering wheel. It uses camera-based vision sensors to detect and measure the car's position within a lane. If the vehicle continues to drift and no corrective action is taken, the system will step in and automatically align it back to the correct lane position. This system can detect when you're approaching a vehicle or obstacle at an unsafe speed, thanks to advanced sensors mounted in the front. If this happens, it sends an alert, and if the driver does not respond, the brakes are engaged to mitigate a potential impact9. Using ultrasonic sensors, this system makes parking smart. It controls the steering angle while displaying directions for you to operate the gear position, brake and accelerator on the 7-inch customizable in-cluster display9. See what's behind you with a high-resolution display on the touchscreen using the available ParkView® Rear Back-Up Camera. It automatically engages when you shift into Reverse and uses dynamic gridlines to help steer you safely into position. This standard safety feature uses a sophisticated system to control all 4 wheels independently and apply individual brakes automatically. It helps you maintain control during adverse weather conditions or defensive driving manoeuvres3. Take a look at the Chrysler 200 today!